In 1923, three years after transition to civil administration, the High Commissioner, Sir Herbert Samuel, suggested the creation of new designs for a definitive stamp issue to the Postmaster General. 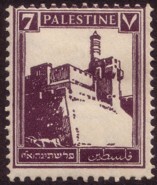 Subsequently the public was invited to submit pictures, four of which were at the end chosen for the new series of stamps. But it was not until November 1926 that Crown Agents invited tenders for the production of the plate dies and the production of the stamps themselves. 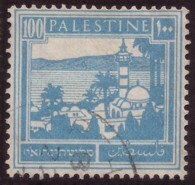 The apparent set off was the then imminent (November 1927) reform of currency: 1 Palestine £ = 1000 Mils. 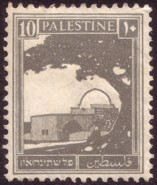 A new currency was issued in Palestine on the 1st of November, and was simultaneously adopted by Trans-Jordan. At the end of the year notes and coins to the value of £P.1,635,296 were in circulation. 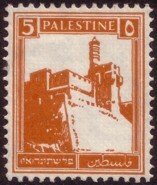 New issues of postage stamps were made in Palestine and in Trans-Jordan. Crown Agents commissioned Fred Taylor for the artwork on the four pictures submitted from the High Commission. The die plates were, according to Norman Collins, produced by Thomas De La Rue & Co., but the contract went to Harrison & Sons, Ltd. in London, for printing the stamps in typography. Printing started on 13.04.1927. 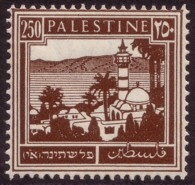 In 1927 a pictorial issue came out, the design being by J. Benor Kalter of the Zionist Commission. [...] The designs are not well done and some of the descriptions would apply equally well to other scenes as to the ones designated. Almost any book on the country gives better pictures than the ones on the stamps. 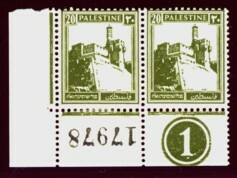 A panel at the top shows the English PALESTINE, framed by European (left) and Arab (right) numerals designating the value. The actual unit of currency (Mils) does not appear, except for the highest value, where £P1 (i.e. 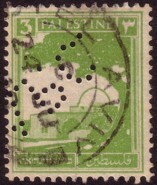 Palestinian Pound) is shown. 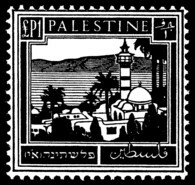 At the bottom of the design two panels say PLSTINH (AI) in Hebrew (left) and FLSTIN in Arabic (right). The size of the designs for the lower values (Types T9--11) is 18.5x22.5mm (stamp size: 20x25mm), the higher values (T12) measure 23x22.25mm (25x24mm), respectively. The three supplementary values issued in 1942 (250m, 500m and £1, all in type T12) have a design size of 24x22.25mm. The stamp size is unchanged. Letter (printed matter). SG no. 91, cancelled with JERUSALEM / 8 30 AM? / 15 DE / 38 (Sacher B37). Destination: Bielefeld (Germany). Official letter. SG no. 99 (vertical pair). 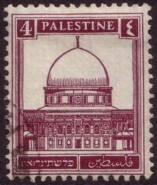 Cancelled NABLUS / AM / 1 JU / 47 (Sacher 4, twice on front, twice on back side). 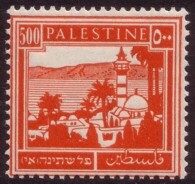 Registration label NABLUS / No 1080 (Sacher 6). 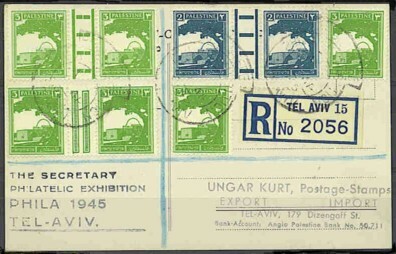 Express delivery from DISTRICT CONTROLLER'S OFFICE / No / DATE / SAMARIA DISTRICT, NABLUS (Sacher 4a, once on front, thrice on backside) to Government Agents, Haifa. On reverse: REGISTERED / 1 JU 47 / HAIFA (Sacher D17). Single franking of SG no. 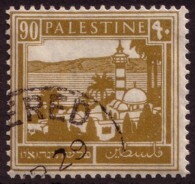 95 of 1927, 7m in red on a letter from Nazareth to London. Unknown recipient. 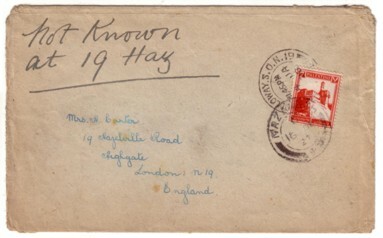 Postmarks: NAZARETH / C / 16 DE / 27, HAIFA / E / 16 DE / 27, and LONDON HOLLOWAY. S.O.N.19 / 4 JA / 28 / 1145PM. 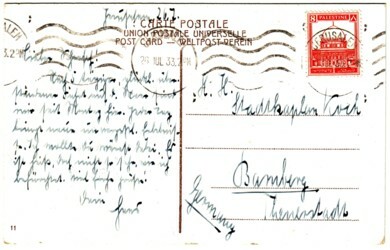 Airmail letter from Gedera to Zeitz, Germany, 15m: triple franking of SG no. 93, 5m. 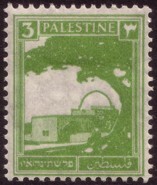 Postmark: GEDERA / A / 3 JU / 36. 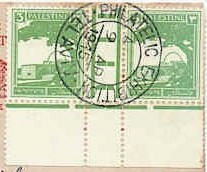 Registered letter Tiberias to Jerusalem, 24m: triple franking of SG no. 106, 8m. 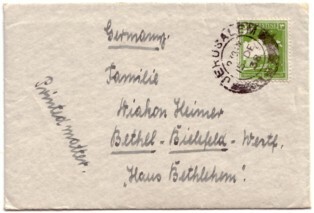 Postmark: TIBERIAS / A / 3 AU / 38. Commercial letter with company imprint: Nablus to Haifa. Franked with 10m (SG no. 97). 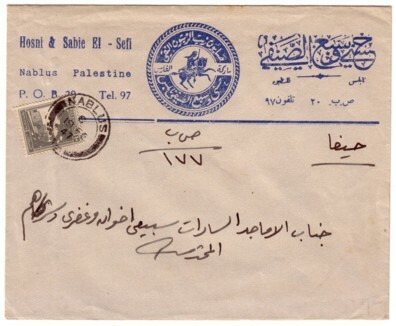 Postmark: NABLUS / C / 19 FE / 47 (Sacher 3), on reverse arrival mark HAIFA / G / 19 Fe / 47 (Sacher B9). Ex collection Dorfman. 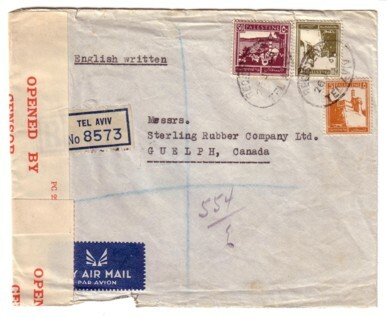 Letter with SG no. 98. Cancellation: T E L A V I V / C / 22 AU / 29 (Sacher B2). Destination: a bank Göttingen, Germany. 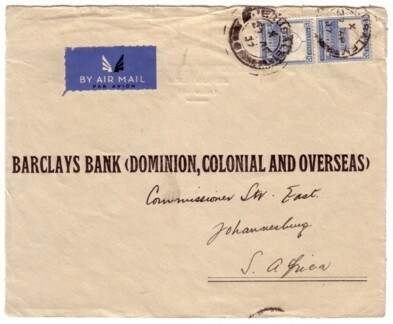 Airmail letter from Jerusalem to Johannesburg, South Africa, 30m: double franking of SG no. 108, 15m. 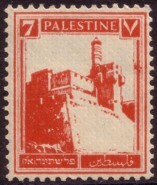 Postmark: JERUSALEM / X / 27 AP 37. 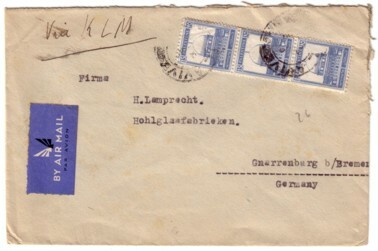 Airmail letter "via KLM" from Tel Aviv to Gnarrenburg, Germany, 45m: triple franking of SG no. 108, 15m. Postmark: TEL AVIV / [?] / [?] AP 38. 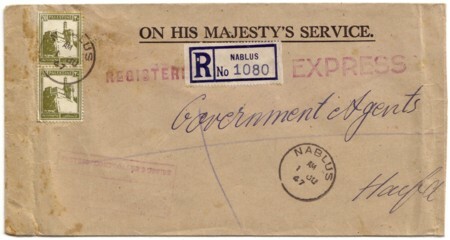 Registered letter from Jaffa to Leeds, 26m: double franking of SG no. 98, 13m. 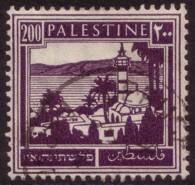 Postmark: REGISTERED / JAFFA / 17 JAN 30. 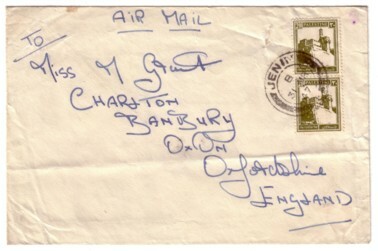 Airmail letter from Jenin to Banbury, 40m: double franking of SG no. 99, 20m. 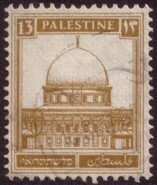 Postmark: JENIN / B / 31 MR / 47. The perforation of the upright values (2m--20m) is 13.5:14.5 in comb perforation. The arrangement of the printing sheet consists of 10 lines and 25 columns in three panes: 10x10, gutter, 10x10, gutter, 5x10 fields. Jubilee lines frame the sheet. The intersecting gutters vary in type according to plate: types C, D, E, F are noted in Bale. Early prints (on A paper) are known without gutters. 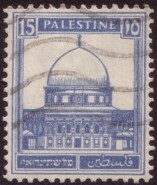 The perforation of the oblong values (50m--£1) is K14:14. The arrangement of the printing sheet consists of ten lines and 20 columns in two panes: 10x10, gutter, 10x10 with jubilee lines. The intersecting gutters show type G, and again, early prints (on A paper) are known without gutters. Plate numbers can be discerned into seven types. They are situated in the four corners of a sheet. Additionally a numerator (current or control number) is found to the right of the plate number in the (usually) top right corner. For some issues, inverted numerators are known. Where a sheet had to be discarded for faulty printing, it was replaced by another sheet (from the same or a different batch) and had its numerator corrected accordingly in order to remain in sequence with the est of the batch. Such corrected numerators, widely known to German collectors due to their use for French occuüpation issues, are not described for this issue in the pecialized literature. 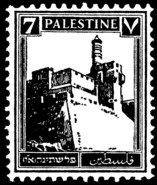 David Dorfman notes that only stock delivered to Palestine was imprinted with numerators. Stock issued by Crown Agents to the (London) philatelic trade did not contain these markings. specialized catalogue. Images courtesy Rolf Wernecke. Again an example of the 20m, SG. no. 99, now with a corrected numerator: the original sheet no. 31555 had to be destroyed and was replaced by faultless sheet no. 31044. 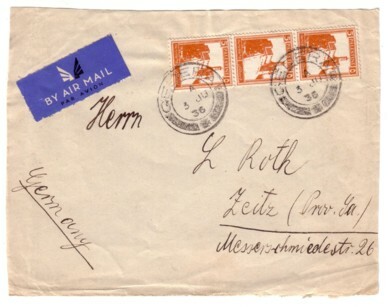 Air mail letter with SG no. 102 (vertical pair). Cancellation: TEL AVIV / 7.30 AM / 30 SP / 42 (Sacher B47). Destined for New York, USA, forwarded to Jackson Heights. Censored at Jaffa-Tel Aviv: PC 22. / OPENED BY / CENSOR. / 70/5233 (Sacher Q7a). New York arrival mark on reverse: NEW YORK N.Y. / OCT 22 / 4 30 PM / 1942 // STATION W.
Postcard with SG no. 106. Machine-cancelled JERUSALEM / 26 JUL 33.2PM (Sacher F3). Destination: Bamberg, Germany. 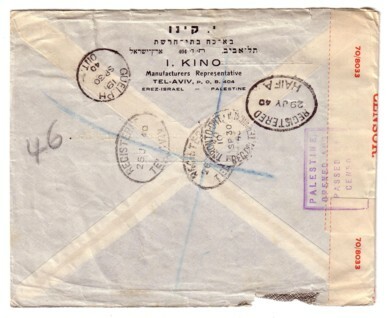 Front and reverse of a censored commercial cover from Tel Aviv to Canada by airmail. 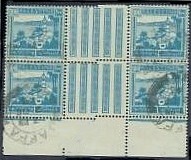 Stamps used: SG nos. 100, 99, and 93. 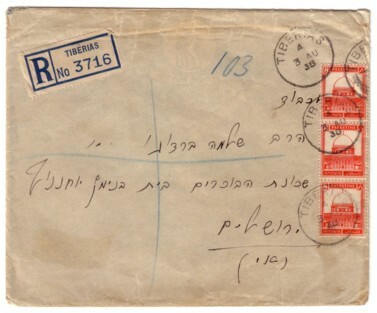 Cancelled by REGISTERED / TEL AVIV / 26 JY / 40 (Sacher D13, twice on both front and reverse side). 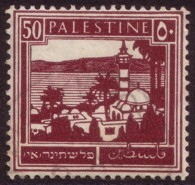 Registration label: TEL AVIV / No 8573 (Sacher RGa). 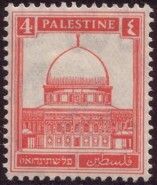 Censor label PC 22 / OPENED BY / CENSOR / 70/8033 in red (Sacher Q7a) and additional censor handstamp PALESTINE. / OPENED AND / PASSED BY / CENSOR in violet (Sacher Q20b, but without a manuscript T-number). On revese transit markings of REGISTERED / HAIFA / 29 JY / 40 (Sacher D13) and TORONTO . ONT / REG.DIV. TERMINAL A / 10 / SP 30 / 40 as well as arrival mark GUELPH / ONT. / 19 / SP 30 / 40. 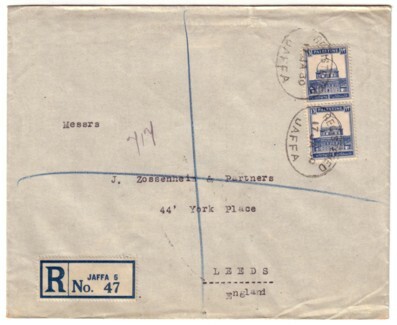 Recently a wide variety of so-called "negative die proofs" have appeared on Ebay and also at traditional auction houses. To my knowledge these prints may have been made from original dies stemming from the Harrison archives (I have my persional doubts even about this), but certainly they have been produced in the last few years only. Their philatelic value can only described as non-existant, at best they are nothing more than a curiosity. The market is now so flooded with this material that prices beyond $10 seem ridiculous. 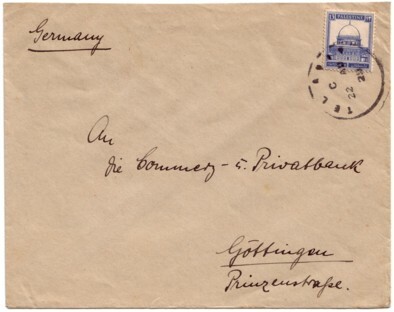 Since 2005 Hundreds such "Proofs" in different values introduced to the Philatelic market, also so call "few original plates" were offered for sell over the Internet ..So my conclusion is that we are dealing here with reproductions & NOT original proofs from the 1927 Harrison & Sons archives. SG no. 91 as perfin: "A.P.C." 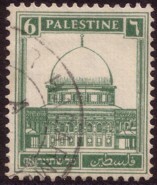 (Anglo Palestine Company), position H.
SG no. 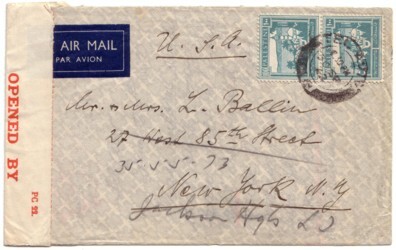 91 as gutter pair (Type E) from the lower margin of the sheet. SG no. 102 (gutter block) with so-called "staggered" perforation. Image courtesy Ebay. SG no. 94 with plate (?) error: missing parts top left. SG no. 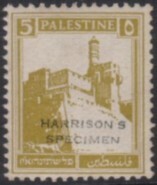 93 in a different colour, marked "HARRISON S / SPECIMEN". Described as a colour trial: fake or genuine? 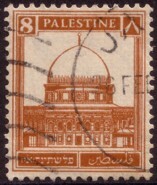 this paper was only used for the initial printing since the sheets were extremely difficult to handle due to excessive curling in the dry climate of Palestine. 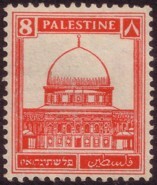 The first set of the new stamps was issued on 1.06.1927 (3m, 13m), followed by 12 values on 14.08.1927. The values of 4, 7, 8, and 13m were reissued in changed colours in 1932, together with one new value of 15m (due to changes in postage rates). 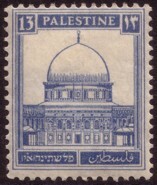 The last installment of stamps was first sold on 15.01.1942, namely the three high values of 250, 500m, and one Pound. Due to high demand stamp coils were produced. The early coils were handmade from regular stamps, later industrially produced coils use specially made coil stamps with distinguishable perforation.